U.S. labels Los Zetas as Mexico's most "sophisticated and dangerous cartel"
VERACRUZ, Mexico (CNN) -- The dead always tell a story. And in Mexico that story is the fight for the right to meet U.S. demand for illegal drugs -- a war becoming more violent and ruthless, mostly because of one group. 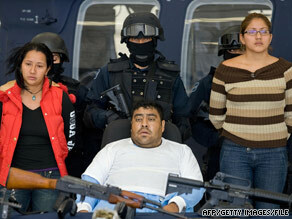 Suspected members of Los Zetas drug cartel are presented to reporters in Mexico City in April. Its name is Los Zetas. Imagine a band of U.S. Green Berets going rogue and offering their services and firepower to drug cartels. That's what happened in Mexico in the 1990s. Commandos from the Mexican army deserted and set up a cartel, known as Los Zetas. The U.S. government says Los Zetas is "the most technologically advanced, sophisticated and dangerous cartel operating in Mexico." Los Zetas are blamed for last week's brutal killings of the police chief in the southern Mexican city of Veracruz, his wife and four children. The way in which the killers carried out their crime sent a message. With their fierce weaponry and military expertise, Los Zetas are considered the most formidable enemy in the drug war. This week on "Anderson Cooper 360," Michael Ware reports from Mexico on the gruesome tactics used by drug cartels. Thursday: Ware tracks "El Chapo," one of Forbes' wealthiest people in the world and also the most wanted man in North America. "The Zetas have obviously assumed the role of being the No. 1 organization responsible for the majority of the homicides, the narcotic-related homicides, the beheadings, the kidnappings, the extortions that take place in Mexico," said Ralph Reyes, the U.S. Drug Enforcement Agency's chief for Mexico and Central America. The fight against Los Zetas will take years, Reyes said. "They continue to train new recruits through several campaigns. One of them is the very open and public narco banners that they post around the country of Mexico, specifically tailored to the military and [saying] that they will offer better pay and better benefits if they join the ranks of the Zetas," Reyes said from his Washington office, where he directs the U.S. battle against Los Zetas. With its mastery of combat, Reyes said, the organized crime network operates more like a U.S. infantry company patrolling the streets of Falluja, Iraq, than a street gang. Newspapers in Veracruz have headlines almost every day about drug cartels' bloody violence, more often than not linked to Los Zetas. The DEA said that although the group originally was based on military lines, the cartel has been built into a business structure, with quarterly meetings, business ledgers, even votes on key assassinations. And now Los Zetas are taxing businesses beyond their drug reach -- from human trafficking across the U.S. border to, as one recent scandal showed, imposing a kind of tax on the Mexican government. The state oil company has been bleeding billions to corrupt officials linked to Los Zetas. And, as a DEA agent recently said, the American border makes no difference to Los Zetas. It doesn't matter if violence is perpetrated on the Mexican or U.S. side of the border. Inside the United States, one of the instruments of assassination Los Zetas unleashed was teenager Rosalio Reta. Given six months of military training in Mexico, he was sent across the border to target rival drug gangs. He was 13 years old when he committed his first killing. "I loved doing it," Reta says in a police interrogation tape. "Killing that first person, I loved it. I thought I was Superman." U.S. officials have said there are many more like him.